The gospel i s about God’s work on behalf of sinners. He has brought salvation and eternal life within our reach by the sacrifice of His Son on the cross. He paid the price of our redemption, from the vilest sinner among us to the most innocent child. His purpose is to restore the intimate relationship He had with His human children before Adam and Eve sinned. The apostle John wrote about God’s “end game” in Revelation 21. “And I heard a loud voice from the throne saying, “Look! God’s dwelling place is now among people, and God himself will be with them and be their God. He will wipe every tear from their eyes. There will be no more death, or mourning or crying or pain, for the old order of things has passed away” (Rev. 21:3, 4 NIV). That’s God’s plan, His great hope for you and me. Our worst enemy has other plans. I’m talking about Satan and his campaign to disrupt God’s plan. His aim is our ultimate destruction. He promotes confusing ideas about God. He nurtures false doctrines that leave unsuspecting victims wide open to deadly deceptions. 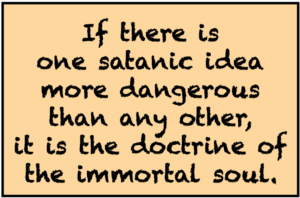 If there is one satanic idea more dangerous than any other, it is the doctrine of the immortal soul. That’s right! Immortal soulism is a foundational and absolutely essential component of Satan’s strategy. It creates potentially fatal vulnerabilities in the hearts and minds of people who mistake falsehood for truth. By convincing you that the dead aren’t really dead, the immortal soul doctrine leaves open the possibility of communication with friends and loved ones who have died. You might find yourself in contact with demons impersonating deceased people that you know, love, and respect. You might receive messages from “the great beyond” that contradict the teachings of God’s Word. Without the immortal soul doctrine, Satan loses a vital channel of communication. Here is where Bible truth is protective: it teaches that we are mortal beings; death is an unconscious state; there is no possibility of communication with the dead; bodily resurrection is the “cure” for death; and eternal life is possible through Jesus Christ. “For this is how God loved the world: He gave his one and only Son, so that everyone who believes in him will not perish but have eternal life” (John 3:16 – from the New Living Translation).